For over thousands of years Indian culture has been greatly influenced by the great epics, folklore & real life heroes. 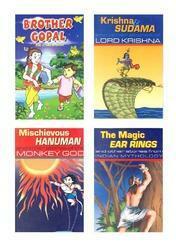 Presented in this series are some of the best loved stories drawn from mythology, folklore, history & fantasy which have become an intrinsic part of Indian childhood. Size: 12 x 18 cms. The Ramayan is the epic tale of the victory of good over evil. The inside pages are colourful and stunning format to capture the imagination and minds of its readers. Looking for Learning With Stories ?